In his Initiation Into Hermetics, Franz Bardon gives detailed instructions on how to make a magick mirror that will charge the room it is in with any energy that the magician so desires. Well, this device will do the same thing, only with radionics. The instrument itself is nothing more than a modification of the Circle Box with on modification. There is a metal witness plate on the top of the box wired to the central circle for the witness of your intent, in other words what you want to charge the room with. 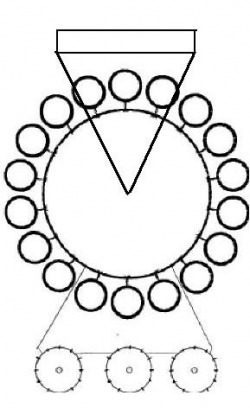 The box is stood upright in use so that the energies from the large, metal circle in the center, will broadcast to the entire room, affecting anyone who enters it. In use, you simply stand the box on the table in front of you, place the witness on the top plate, set the rate, then stand the box in a location where it will shoot out into the room. That is all that you need to do, the radionics will do the rest.